Rarely in life do I see something SO GREAT that I just can't keep it to myself. I ran across this picture today on the internet. 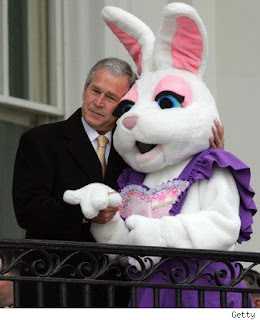 I mean, come on...our president hugging a person dressed up as a bunny!!! And the way he is leaning into it and holding it's hand, too funny! But, I also must say, what is up with the bunny's eye shadow? It is a little out of control. Same with the ginormous heart on the dress. All of this is just TOO GOOD! The President and the Easter Bunny.... how great!!!! This is Awesome. Thanks for the laughs!! !